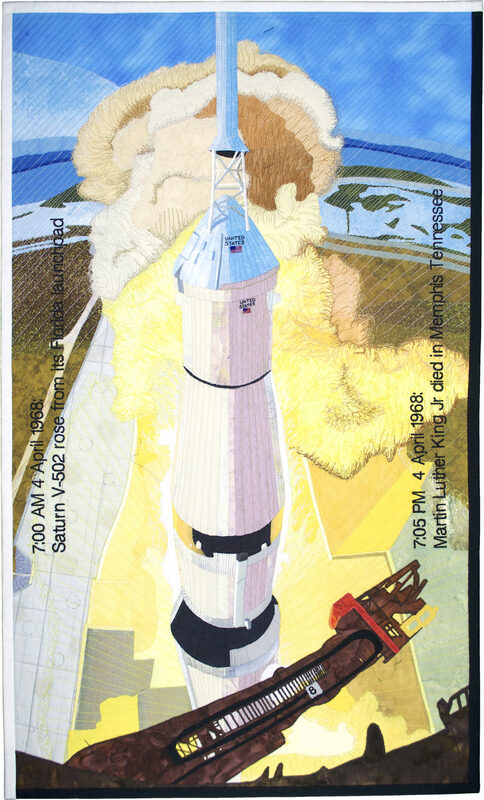 7:00 AM 4 April, 1968: Unmanned Saturn V-502 rose thunderous from its FL launch pad. That was nearly the last normal thing the big rocket did. 1. Low frequency fluctuations known as the pogo effect, caused the rocket to bounce around for about 30 seconds. 2. Second stage initiated and 2 of 5 engines stopped. The remaining engines fired longer to compensate, it did not achieve desired elevation before stage 2 fell away. 3. S-IVB third stage had to burn longer, putting the spacecraft in an orbit of 178 by 367 km instead of a circular 160 km orbit. 4. Attempted maneuvers to stimulate translunar infection failed. Command and service modules were separated. 5. Onboard 70 mm camera operated by computer was a spectacular success. Photos taken changed mapping procedures. 6. Final test: replicate approach and reentry of future lunar flights, lack of fuel resulted in short, but successful 10 hour mission. 7:05 PM 4 April, 1968: Martin Luther King Jr. died in Memphis Tennessee. This day began with hope (hence the white binding on the left and top sides) and ended with sorrow (the black binding on the right and bottom sides). Applique (both turned and raw edge piecing) using a layer of fusible interfacing with the pattern drawn on it, and machine piecing of the rocket sections. Layers of tulle were used as overlay to reduce the impact of the background and bring the rocket forward. The flag and words United States were hand embroidered. Quilting was free motion as well as completed with a walking foot. Cotton fabrics, hand dyed as well as commercially printed. Tulle was used to mellow out the piecing and suggest smoke and gasses expelled. Embroidery ribbon was used to make the framework that supported the top cap of the rocket. All artwork on this site © by each artist | Website questions?